With its weight and purity guaranteed by the United States government, the Gold American Eagle is one of the most popular gold bullion products in the world. Investors and collectors alike strive to own these beautifully struck coins because of their inspiring design and quality. 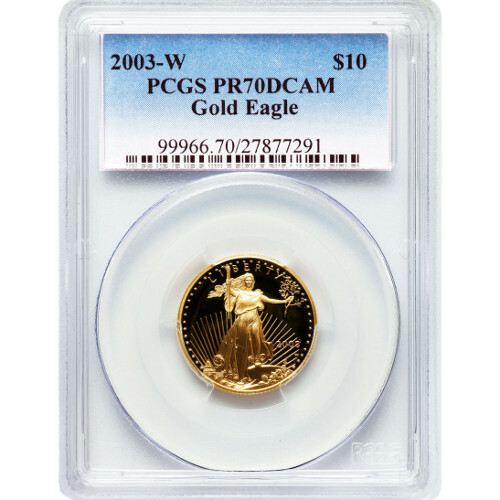 Today, you can purchase 2003 1/4 oz Gold American Eagles from Silver.com with a “W” mint mark and Proof 70 grade from the PCGS. 2003 Gold American Eagles with a “W” mint mark originated from the West Point Mint in New York. When a coin receives a PR70 grade from the PCGS, it is considered a perfectly struck proof coin. These coins were struck several times to create a strong frost on the design, with a deeply mirrored, clear background field. This is known as “deep cameo,” or DCAM. Here at Silver.com customer service is one of our top priorities and we want you to be satisfied with your purchase. If you have questions about any Silver.com products or the online purchasing process, feel free to contact our associates at 888-989-7223 or online using our live chat.